The OxiMax MT Series is a range of online Electrochlorination equipment designed to produce hypochlorite from water with salinities ranging from 500 ppm to seawater. The machines are reliable, compact, modular, cost effective and light weight, allowing wall mounting and simple expansion if required. The MTLS Series is designed specifically for low salinity (3 – 8 g/l) swimming pools and water features. Multiple modules can be combined to give outputs from 70 – 2,500 g/hr. The MTS Series is designed for seawater (25 – 40 g/l) pools and modules can be combined for outputs from 300 – 3,000 g/hr. virtually any salinity water. This new Series is enormously flexible and uses velocity cleaning to prevent scale build up on the tubes. Applications range from swimming pools, to on line water treatment, to offshore facilities. Saline water from the pool, sea or process is passed through the Cells at high velocity, giving high efficiency and self-cleaning. 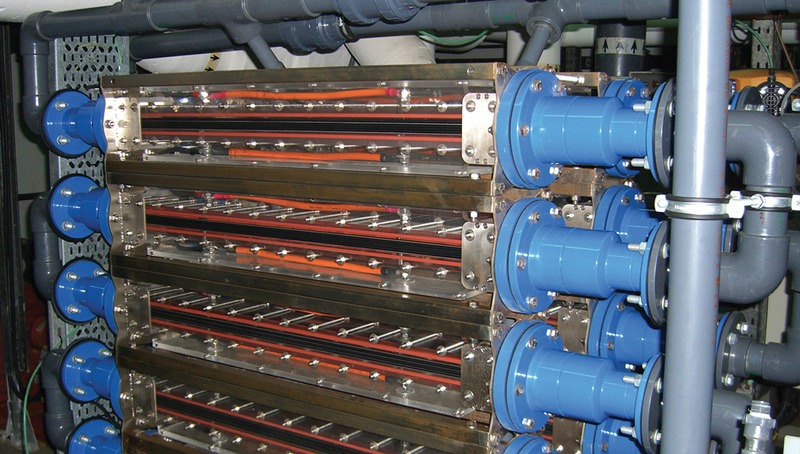 The control system allows DC power to be applied to the Cells, resulting in the production of Sodium Hypochlorite, which transfers back to the pool, seawater system or process. automatic control, allowing precise disinfection levels to be maintained at all times. Typically, Microprocessor control is used, although PLC control with a touch screen HMI is also available. 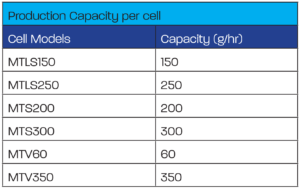 If you have a 3,000,000 litre seawater swimming pool, we can offer an MTS3000/10 = 10 x MTS (300 g/hr) cells. If you have a 1,000,000 fresh water swimming pool, we can offer an MTV1050/3 = 3 x MTV (350 g/hr) cells.s. MTLS, MTS or MTV cells are used as the basic building blocks to form an entire OxiMax MT Series Electrochlorinator.